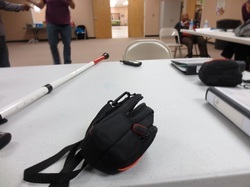 My ﻿﻿﻿﻿ first photovoice project was conducted with blind and low vision people at the Vision Resource Center in Fayetteville, NC. To view this project's video documentary, ﻿﻿﻿﻿﻿photo book﻿﻿﻿﻿﻿ or policy memo (sent to the State of North Carolina), please go to my photovoice project NC page﻿﻿. To learn more about the photovoice methodology, please continue reading below. Photovoice is a qualitative research methodology (from the tradition of participatory action research) where participants help to design the research problem and the end result is a set of photo-narratives. It was originally pioneered by Dr. Wang when she was a professor at the University of Michigan School of Public Health (Wang and Burris 1994). More recently, it has been used successfully to empower patients suffering from traumatic brain injury and to determine the strengths and problems with their health care (see Lorenz and Kolb 2009 and Lorenz 2010). Please note: In the UK "PhotoVoice" is the name of a registered charity that uses (and further develops) the methodology pioneered by Professor Wang, see www.photovoice.org. Sensory photography uses other senses besides sight to take photos (e.g. the sensation of heat, or the feeling of touch). When blind and low vision people participate in a photovoice project, they learn how to take photographs through this technique. For examples of prior work using sensory photography, please see how blind British and Mexican individuals have been empowered through participating in photovoice projects through the UK organization PhotoVoice on this website: http://www.photovoice.org/html/methodology4sp/. Lorenz, L. S., and B. Kolb. 2009. “Involving the public through participatory visual research methods.” Health Expectations 12(3):262–274. Lorenz, L. S. 2010. “Visual metaphors of living with brain injury: Exploring and communicating lived experience with an invisible injury.” Visual Studies 25(3):210–223. Wang, C. C. 1999. “Photovoice: A Participatory Action Research Strategy Applied to Women’s Health.” Journal of Women’s Health 8(2):185. Wang, C. C., and M. A. Burris. 1994. “Empowerment through Photo Novella: Portraits of Participation.” Health Education & Behavior 21(2):171 -186.